Supporters of health care reform rallied in front of the Supreme Court in 2012 on the final day of arguments regarding the first case involving the Affordable Care Act. The law goes back to the Court, this time over subsidies for low- and middle-income people. 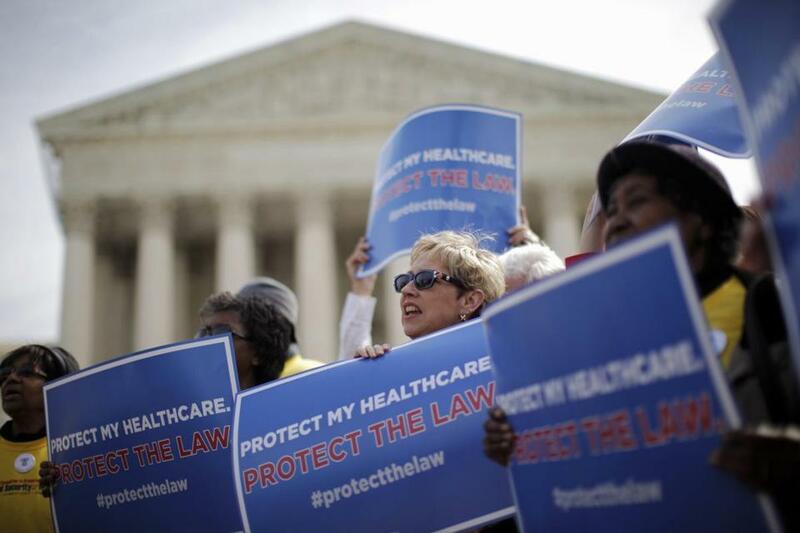 The announcement Friday that the Supreme Court will once again be looking at the issue of whether Obamacare passes legal muster has created an outpouring of gnashing of teeth among liberals. For good reason. It was only two-and-a-half years ago, after all, when the Court was one vote short of ruling the law unconstitutional. Surely with a second chance at the apple, the Court will use this opportunity to eviscerate the signature achievement of Barack Obama’s presidency. Not so fast. There’s good reason to believe that Obamacare is safe, but even if the Court were to rule against the government, it creates as many political problems for Republicans as it does for the White House. First, it’s important to make clear that it’s a travesty that the highest court in the land is going to waste one minute on this case. The argument being made by the plaintiffs, i.e. intractable ideological opponents of President Obama, is that because of a typo in the law that doesn’t make perfectly clear that subsidies should be provided to Americans who buy their health insurance from the federal health care exchange (as well as state exchanges) literally 4.5 million of Americans are at risk of seeing their premiums rise dramatically or losing their insurance altogether. Altogether as many 9 million could be hurt if the plaintiffs win — and the decision could unravel the entire law, affecting millions more. One has to engage in the most willful and mendacious reading of Obamacare — and ignore the clear intent of Congress — to draw the conclusion that the federal government didn’t intend to provide subsidies to all Americans eligible to receive them. That there are individuals intent on pursuing a case that would literally strip away health care for millions of Americans is a moral transgression of the highest order. I can’t possibly imagine how anyone who is cheering for the Court to do this can actually sleep at night. And that’s precisely why I’m really not all that concerned. At its core, the appeal has basically nothing to do with the law itself. Sure there are legal issues at stake, but they are patently ridiculous. For the court to rule against the government and strip away federal subsidies would be a political decision — not a legal one. That the at least four justices voted to take up this case is an indication of how politicized the Supreme Court has become. Of course, that was also the case over two years ago when the Court first accepted a less flimsy but still rather suspect legal challenge and when Chief Justice John Roberts refused to fall in line with his other conservative/Republican-chosen colleagues and throw out Obamacare. So it begs the question: Why two years ago, when killing Obamacare would have affected very few Americans and politically resonated almost completely in favor of Republicans, did Roberts fail to join his conservative colleagues — but two years later, after Americans have already begun benefiting from the law and when the political impact is hardly a slam dunk for Republicans would he decide to make a purely political decision now and eviscerate the law? Why would Roberts do that to himself and to his legacy as chief justice two years after he was the guy who quite literally saved health care? An even better question is why would Republicans want him to? It is true that Americans are not big fans of Obamacare but they don’t want it to be repealed either — and neither do Republican office holders. Sure there are plenty of Tea Partiers and ideological conservatives who pine for a day when Americans can’t buy subsidized health care and are left at the mercies of the free market for purchasing life-saving health care coverage. But the smarter ones understand that an adverse decision in the Court would put the onus on them for fixing health care — and for providing relief for those who were already benefiting from the law. Calling for repeal has always been a consequence-free way to attack Obamacare because Republicans knew it was never going to happen. But if literally millions of Americans were to lose their health insurance subsidies and see their premiums rise and perhaps their insurance taken away, repeal of the law becomes something quite real. Surely, some Americans will blame the president for this turn of events, but plenty of others will be demanding that Congress fix the problem immediately. Considering that the GOP is the party of repeal it stands to reason that it will be them, not Obama, who will get blamed if the situation isn’t fixed — especially since Democrats will have every incentive to make this the signature political issue of 2016. The last thing Republicans should want is to find themselves being pressured by Tea Partiers who demand no compromise on Obamacare and actual constituents asking why aren’t you getting my government subsidy back? This situation would be quite different from where we were in 2012. Then the law was for many Americans still an abstraction. Today, it is something tangible and valued. An adverse decision from the Court would literally take something away from voters that they like and that is important to them — and Republicans could end up in the position of refusing to return it. I can’t think of a single political party that has ever benefited from a situation like that. It’s the reason why, for example, Republicans complain bitterly about big government and the federal welfare state but have been utterly incapable of dismantling it. Americans might talk a big anti-government game, but they don’t want anyone taking away their Social Security, their Medicare or, now, their health insurance. Of course, one never wants to say never, especially when we’re dealing with the Supreme Court and ideological extremists like the modern Republican Party. But Obamacare isn’t quite in as dire shape as it seems. • Laurence H. Tribe: A death blow for Obamacare?